For some reason, the Catalyst all-in-one reminds me of an overhead projector that I used to have in my high school. Sure, the bulb is a little high, and wide, but that is only because it is a microwave. In all honesty, I don’t see how that bar can hold up all that microwave oven, really. Of course, that isn’t selling point of this Catalyst. Not that this isn’t selling yet, of course. 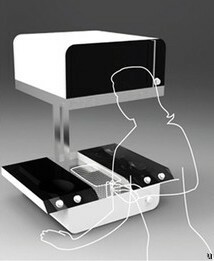 The cooking top or range can split open, revealing a deep fry cooker underneath. Granted, you probably should be cutting down and not increasing your trans-fat content, and my Source has pointed out that a deep fry cooker creates some serious oily vapors. So, if this concept ever becomes a reality, I am not looking forward to the box that it comes in. I mean, there is a lot of negative space on this product. I can just picture all of the styrofoam that would be wasted in this box. This is stuff you have to think about when you have a product like this. Also, you should probably think about how much counter top space that one has to have enough space for a product like this. I say, a Catalyst Cook is a person, not an overhead projector!